Vinyl films are increasingly becoming an accepted alternative finish, coating the entire hull of the yacht, providing surface protection, thereby preserving the gel coat and retaining resale value and also offering the opportunity to add unusual colours and textures not available in paint. The cost of vinyl finishing, otherwise known as ‘wrapping’, is also extremely economical with a saving of typically two thirds of the cost of traditional finishes due to the considerable reduction of labour time. Protect your yacht against the elements including damaging UV rays and outperforming paint. Films do not require the same lengthy preparation process as its paint alternative, typically two thirds of the cost of traditional finishes. Solvents are locked into the vinyl itself, not only is it a greener option, but they do not carry the same risks as paint. Foil and film finishes do not go cloudy, out performing its paint counterpart. In the long run, this saves a large amount of time and money. Our vinyl film is hard wearing, durable, easy to clean and easy to repair. 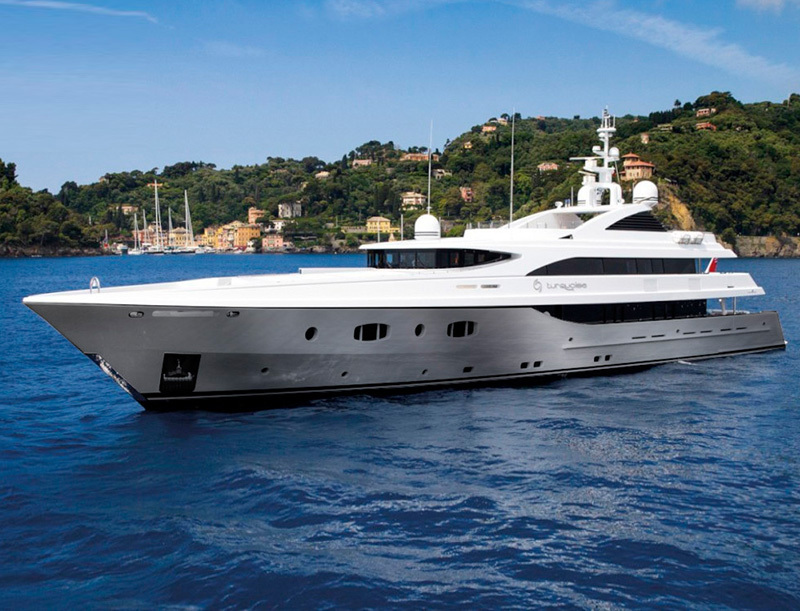 Using films does not require the same lengthy preparation process as its paint alternative, there is no need to sand and prepare the yacht, in fact once the boat has been filed and fared, all that is required for preparation is a liquid based surface cleaner. In the past, due to its reversible nature, vinyls have been used as a form of branding, however modern day vinyls are highly durable, often outperforming paint against the sun’s UV rays. Vinyl film protects and prolongs the underlying finish of the hull and superstructure from the elements, including damaging UV rays. It is hard wearing, durable, easy to clean and easy to repair. Foil and film finishes do not go cloudy and are very easy to clean and repair if necessary. 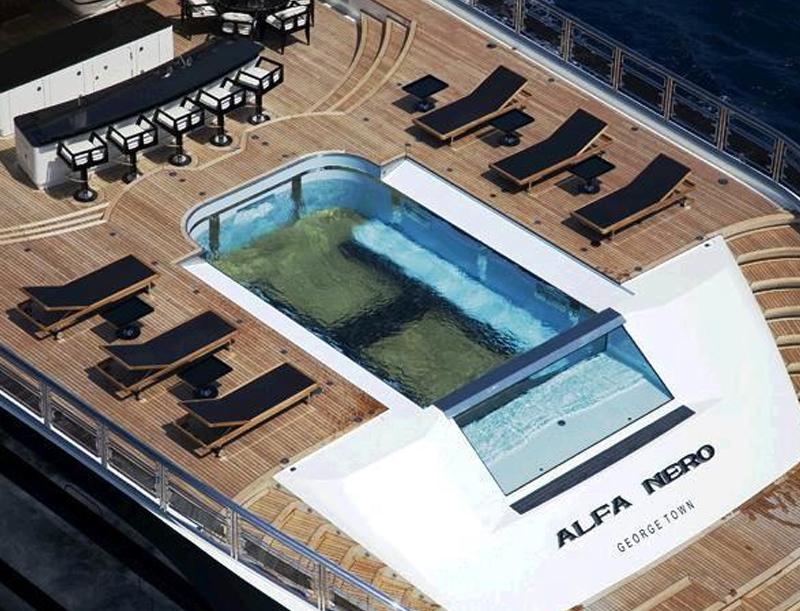 The yacht will also be protected well against the elements including damaging UV rays. Foils and films can be applied directly to the existing surface of composite yachts, new build Stainless Steel or Aluminium yachts, on the other hand, will need a primer coat before the new vinyl is applied but this can still provide a saving of up to seven months in the shipyard as there is no need to paint the yacht with a finishing coat at all. Plus Vinyl film has no risk of orange peel due to it being preset in a controlled environment. The production of cast PVC is more consistent and regulated guaranteeing even film coverage without the appearance of orange peel. With the use of special effect and textured films such as marble, embossed-wood grain, leather, sequin, silk, chrome, carbon, satin, pearlescent and snakeskin, these can be applied as architectural finishes to a range of surfaces from furniture/ tables, fixtures, wall panels, doors, staircases, overhead panels, showers, flat surfaces to impossibly compound surfaces. Something that paint can’t do! Wild Group skilled fitters can apply architectural finishes to a range of surfaces from furniture/ tables, fixtures, wall panels, doors, staircases, overhead panels, showers, flat surfaces to impossibly compound surfaces. Click below to view full range of 3m Di-noc. Paint is designed to be dry and in wet conditions such as swimming pools and Jacuzzis, often there are problems such as staining, bleaching and general break down of the paint. In comparison there are specialist vinyl films that are very stable and when applied correctly these are a far better option. Every yacht owner knows that the sun glare on the water is a cause of concern. All our window films are cut to prevent 99.9% UVA & UVB rays. 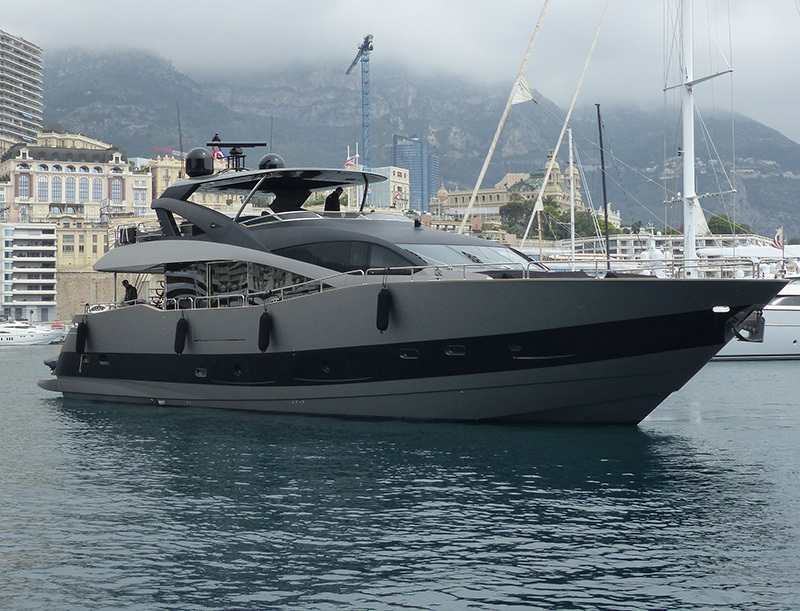 With a range of the highest quality films available, window filming can also make the yacht more aesthetically pleasing. 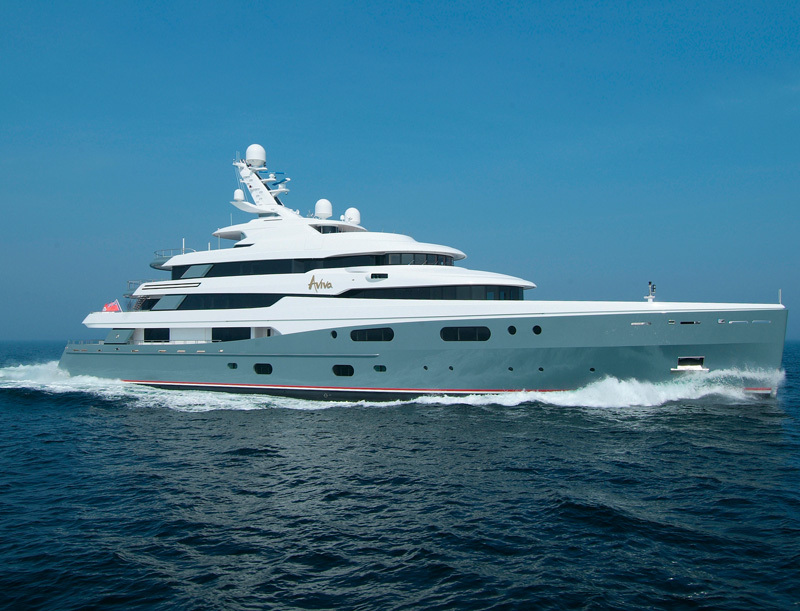 We have been fitting film to all types of yachts, motorboats and increasingly super yachts for over twenty years, proudly working at build stage around the world, instilling confidence that the standard of work carried out is the highest possible. Reduce glare by up to 80% from the sun and water. This reduction in glare, makes using your yacht much safer in sunny and hot conditions. Reduce the amount of fading from the sun’s, by blocking 99.9% of UVA & UVB light. 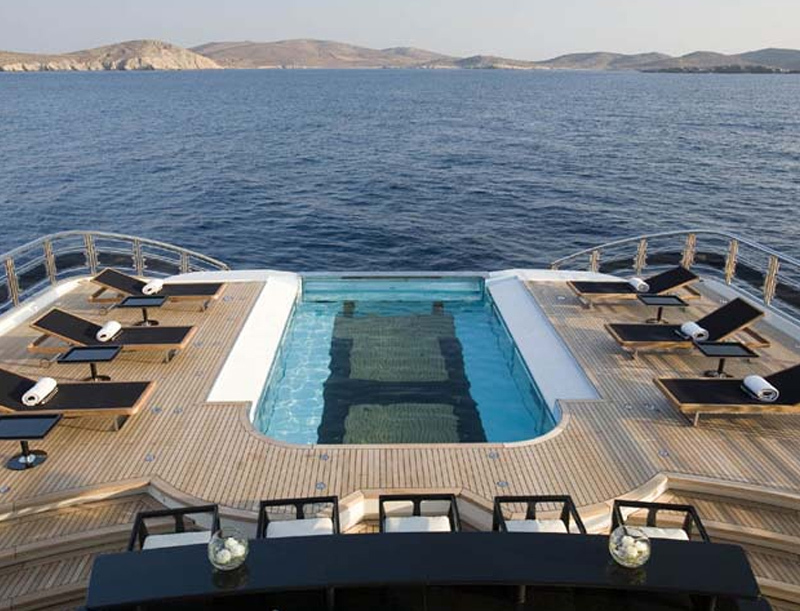 By cutting the suns glare and excessive heat your yacht interior and furnishing is therefore kept in good condition. Window filming provides increased privacy and security for yourself, and your possessions. By blocking up to 80% of glare, and 99% of UV radiation, window tinting makes your yacht a lot more comfortable during the warmer months. During the winter, the low energy coating window films will act as an insulation to the glazing, keeping your boat warmer during the cooler months. 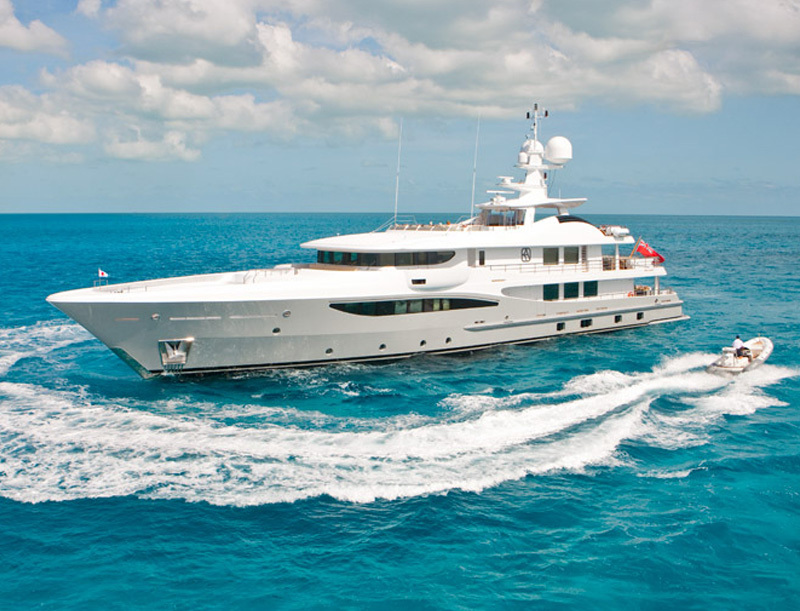 Application of Clear vinyl surface films protect from general wear and tear and scratches, eliminating paint damage and preserving the residual value of the yacht. The vinyl surface film is easy removed and doesn’t leave any residue or damage to the surface beneath when removed or replaced. It is extremely tough wearing made from urethane vinyl film and has a non-slip surface that comes in particularly handing when at sea. This depends on the size and complexity of the project. Vinyl has the advantage of being quicker than paint because the job only needs doing once, here is an example. 6. remove masking so you are going down the boat 6 times. To apply a vinyl stripe you only go down the boat once, and at most twice if the stripe is tapering. It is not that vinyl is cheaper but rather that you do the job fewer times. What is the Durability under UV? The real durability of a product depends on a large number of parameters, including, among others, the quality and the preparation of the substrate, exposure (environment, climate, exposure angle), the maintenance of the vinyl and the amount of pollution. The degradation of the materials (such as the slight and progressive change of the colour and the gloss) is a natural and unavoidable phenomenom for both vinyl and paint. Because of the great variety of substrates and possible application methods the installer must examine the suitability of the media for each application. 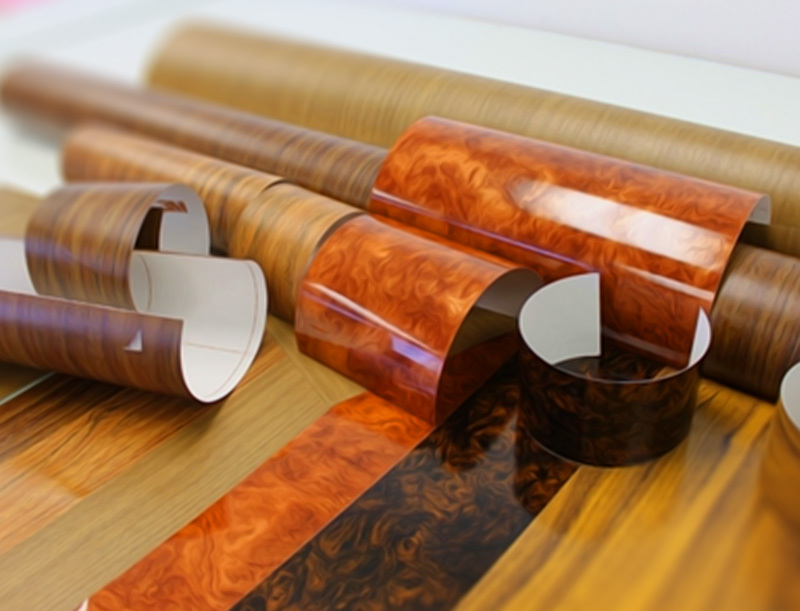 The pigments (colouring) of the PVC film influence the durability of the colours. An estimate of the durability is obtained by aging tests of the cast vinyl under UV-rays and by natural exposure. Based on a vertical exposure, White and matt blacks (vinyl) can last approximately 10 years in a central European climate, considerably longer than the paint alternative for these specific paints. Colours, other matts and gloss tinged vinyls have an indicative durability of eight years. Structured effect vinyls (carbon, alligator, sequin, leather, brushed alluminium) have an expected five years durability and metallic (gold, silver and chrome) four years. Other positions accentuate the climatic impact and an alteration of gloss, colour and even a slight powder effect may occur. A vinyl application on an engine hood for example is particularly harsh because of the horizontal exposure and the heat coming from the engine. What is the longevity of the vinyl? As with paint, this depends on what you are asking the vinyl to do. On exterior work vinyls have a great resistance to UV but will be damaged by coming alongside with no fenders down. If left alone (no hitting pontoons) vinyl can be as stable as the best paints and is certainly better than gel coat. For reasons that we have not worked out, vinyl fairs very well against fender wear. Does my yacht need to come out of the water? This is a question commonly asked on full hull wraps, and in this instance the answer is ‘Yes’, but there is a lot of work that can be done in the water – interior work being the obvious example, however, work on super structure and detailing may also be able to be done in the water. How do I maintain a vinyl finish? Do I need to Buff? Do not buff vinyl. Keep it clean by using water and cloth. It is a good idea to use products like ‘Permanon’ to help keep the vinyl looking as good as it possibly can be. Does vinyl offer the same deep coat finish as paint? It is important to note that vinyl is not comparable to paint but an alternative method with varying advantages and disadvantages so in order to set expectations it must be noted that Vinyl film does not offer the deep finish that paint can offer but it does offer a host of colours and effects for interior and exteriors as well as solutions for problems that arise in paint such as more durable matt finishes and intricate detailing that are simply too complex for a sprayer. 2015 – Yes – with the new Farben films – rivalling paint in gloss readings now. With vinyl it is important to follow the standard health & safety procedures but you do not need the extensive equipment (breathing equipment, eyewash stations, technical clothing, extracts) or carry the same risks as with a paint job. There are no fire and explosive hazards. Would you consider it a greener option than paint? Yes because the solvents are locked in. What is the durability of the film? Paint has been argued as being more durable and tougher than a film, however, this depends on the quality of paint and vinyl being compared, one thing that can not be argued is that paint is less convenient, costly to repair and suffers considerable Health & Safety/Green issues compared to vinyl. In order to get the best durability, vinyl selection is very critical because some films perform better in certain situations than others. On one end of the scale there are industrial films used on floors in production plants and shopping centres and at the other end there are delicate decorative films for walls, there are films on planes, cars, trains, busses and boats so it is difficult to talk about ‘durability’ across the board – however we would expect a correctly selected film to give very good durability. How big can the vinyl go? Vinyls come in different roll lengths and widths, however, the norm is 50m long x 1.5m wide. This is for the main reason that vinyls wider than this are difficult to manage on site. How easy is it to repair damaged vinyl? There are 2 levels for repairing vinyl. The first is owner/crew repairs, which are carried out on the fly, this usually involves a ‘patch’ over a damaged area (in the same colour) to give colour consistency in that area. This is a very convenient solution for small areas and while the boat is out in service. The second level is for larger damaged areas, and this is best repaired by skilled fitters. Will I see any joins? Only if you are looking for them. We generally say unless you know the joins are there you won’t see them as they are disguised over features like chines/cavita lines/stripes and so on. A skillful fitter will put joins in places where light changes on the boat and so they are difficult to see. Yes, far easier than paint! Its not a fun job but essentially its just a case of peeling the vinyl back. Subject to how long the film has been applied it may leave some adhesive residue behind. This is easily removed with a mild solvent and elbow grease. Here is a big advantage for vinyl films, you can buy a new boat in white, colour it in vinyl and when you come to sell strip it back to white – revealing a brand new gel/painted surface to potential new owners. How important is the fairing/ straightness? It is particularly important for vinyl or foils as these are a constant thickness layer of film that follow the contours of the yacht. Vinyl film does not have the filling properties that paint has. How important is the quality of the film used? Wild Group only use the highest quality selected marine coated vinyl film and cannot emphasise enough the importance of this. Incorrect vinyl selection may lead to shrinkage, adhesion failure and premature breakdown of the film. How do paint & vinyl compare when it comes to Matt finishes? Matt paint is very difficult to apply and touch up as it can’t be buffed or polished in the way that gloss can. The majority of problems occur with suncream/ oil based spillage marks which soak into the paint and cannot be buffed out, similar to marks made when coming alongside pontoons. By buffing the paint becomes glossy and uneven in tone to the rest of the matt coat often resulting in the costly option of a total coat re spray to maintain the consistent finish. Matt or textured vinyls lend themselves to a vinyl finish as they are considerably easier to repair. Vinyl is also a great solution as a ‘touch up’ for a paint finish proving an exact match for matt black such as in the case of MY Air. True matt black vinyl marks easily so satins are advised as these are more durable.